The inferior vena cava filter when it first invented by Dr. Greenfield was a minimally invasive solution that offered continued caval patency. The options up to then were ligation of the inferior vena cava using sutures or with an implantable plastic clip. The use of these filters exploded over the past 15 years corresponding to increasing recognition of venous thromboembolism as a morbid complication, the increasing numbers of implanters, and the introduction of retrievability. Removing filters is a serious business because leaving them in for life is not inconsequential. Typically, the period of time that the filter are required for protection exceeds the limits of retrievability recommended on the instructions for use. It is not generally understood that many filters can be retrieved years after implantation, but it is not as simple as retrieval within a few months of implantation which can be done in under 30 minutes. In patients like the one in the illustrations, several years after implantation, the filter comes out only with some patience and a little help from friends. The IVC filter is embedded in the right sided wall of the vena cava and the hook would not engage. From a right internal jugular vein, wire access to the filter was achieved and an 18F x40cm sheath was placed through which a 12Fx50cm sheath was placed. Through this, a floppy glide wire was directed above the struts of the filter, and it curved around and snaked under one of the far struts. This allowed me to snare the wire and bring that out. I placed another wire through the sheaths and removed the sheaths which were around both the Glidewire which was wrapped, and the second wire which was through. The sheaths were then replaced over that second wire, giving me room to maneuver I inside the 12F sheath. The first wire was then retracted with modest tension and it succeeded in lifting the hook away from the wall, allowing me to snare the hook through the sheaths. Once the top of the device was securely in the 12F sheath, the first wire was removed and the filter was removed. The retrieval of an IVC filter device within the parameters of IFU (instructions for use) is like level one of a video game. Challenging for the novice, but eminently doable. The retrieval of these filters left in for years is more like level 25 of the same video game. The nice thing is having friends who can give you tips on defeating that level. 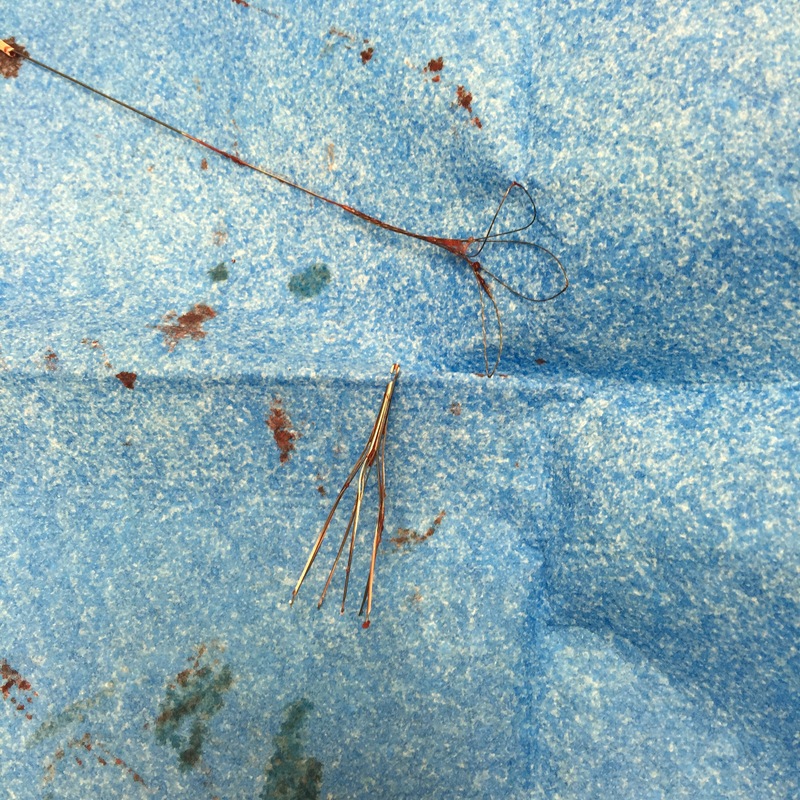 At VEITH symposium a couple of years ago, Dr. Paul Foley presented data and technical details on removing these filters, and this has been enthusiastically taken up by my partner Dr. Christopher Smolock who happened to be walking the halls the day of that case. His tip: “18F Sheath over 12F sheath, tilt the filter, and capture,” he said. “Wasn’t Foley your resident back at Columbia (in 2004)?” he added.